It’s October, shouldn’t my plants be winding down by now? Apparently not in California! To be fair, it’s still supposed to be in the 80s this week, I can understand why my plants are a little confused. My cherry tomato plant has been putting out ridiculous new growth. 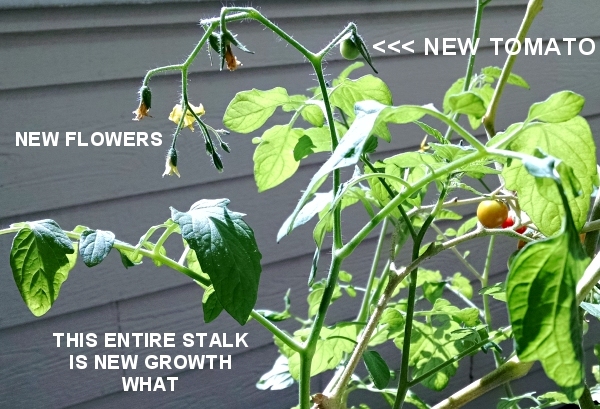 There are still a few tomatoes from the original crop that are finally starting to ripen, but the plant itself has decided it’s time for more flowering and more fruit. I’m looking forward to the first round being over so I can cut the damn plant back a bunch. It really grew all over the place. I’m also getting more flowers and nascent fruit on my bell pepper plant, which I thought had been eaten to death by bugs (it has very sad, chewed up leaves). The chile pepper plant is well into its second round of fruit. I’ve been getting so many chile peppers I’ve just started chucking them into the freezer. When I get enough (I think they’ll be like 50 per ounce, they are so small) I’ll make hot sauce or some very, very fiery pepper jelly. I think the Indigo Rose tomato plant is nearing its end, although I’ve seen some new growth on it, too. But no new flowers. YET. Both eggplants are putting out a lot of flowers, as well as a decent number of fruits. They’re on the small side—maybe because there are so many? Bugs attacked the basil, but I think I’ve course-corrected there. The thyme is still ridiculous. Is it odd that I like to run my fingers through it? It’s sort of like brushing a doll’s hair. I like to work out the tangles. It’s oddly soothing. And you smell like thyme afterward! Really, the only major disappointment has been the kabocha squashes. They’ve been growing well, but I haven’t gotten any female flowers yet. Just male. So no squashes. I’ve been calling it a “kabocha sausage party,” which SHOULD be delicious, and yet it’s just depressing. I’m going to keep trying, though.